Though lesser known that some of the more established wine regions in the nation, Yakima, Washington and the surrounding areas have some amazing wineries. In fact, according to the Yakima Wine Association, grapes grown in Yakima and the surrounding areas are used in more than half of the wines made in Washington state. Last week, my husband and I escaped the hustle and bustle of our daily life and headed to Yakima to celebrate our first anniversary. We were looking forward to a relaxing time at the Orchard Inn Bed & Breakfast while tasting some of the delicious wines that Yakima has to offer. The Orchard Inn Bed and Breakfast was the perfect place to rest every night and enjoy an amazing breakfast each morning. The B&B is nestled in the middle of a cherry orchard. We were blessed to be staying with Henner and Karen Krueger, owners of the B&B, during peak cherry season! Each morning we were treated to fresh cherries as part of our breakfast. The first morning, we enjoyed a delicious stuffed cherry french toast. On our second morning, we enjoyed fresh cherries soaked in sugar and balsamic vinegar, topped with Greek yogurt and cocoa powder as a side to a delicious egg dish with tomatoes and roasted asparagus. Each night that we returned to our room to find a homemade raspberry liquor on our table. Our room was on the second floor and had its own porch. The weather was almost 100 degrees the entire time we were there but cooled down at night. We enjoyed sitting on our porch and watching shooting stars while listening to the humming of the sprinklers in the cherry orchards in the background. We slept like babies on great linens in a very comfortable bed. The room also had a microwave and mini-fridge, so we were able to store leftovers and pack a picnic lunch for our day of wine tasting. My husband also wanted to surprise me with creme brulee, so he called Karen prior to our arrival to make arrangements. Karen was so kind as to call local restaurants to see who could accommodate this order (and let her take home their ramekins with a promise on her life that she would return them). She was so willing to go out of her way for this great surprise. Zesta Cucina in Yakima was willing to create these amazing desserts for us! We had original creme brulee and a raspberry infused creme brulee which was probably one of the best I have ever enjoyed. I highly recommend! Henner and Karen were delightful hosts with excellent suggestions of wineries, restaurants, and sites to see in and around Yakima. As travel agents prior to owning the B&B, it was easy to see how the transition into running a B&B was a natural one for this generous couple. 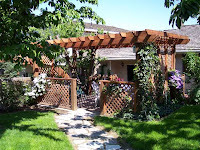 For anyone about to enjoy the delightful wines in Yakima or the surrounding areas, I highly recommend the Orchard Inn B&B! You will have a wonderful experience with service that makes you feel like you are just another member of the family! More to come on the wineries later! Looks like there are not too many other reasons for us to make the trip!